Watches from Montblanc combine traditional Swiss watchmaking with innovative technologies. This manufacturer's repertoire includes state-of-the-art smartwatches as well as complicated tourbillon watches with a chronograph function. The Montblanc brand is inseparable from world-class writing utensils. Leaders around the world sign treaties, laws, and other important documents with the Hamburg-based company's pens. Montblanc has been producing watches in their company factory in Le Locle, Switzerland since 1997. Since the beginning, they have adhered to the strict quality standards established decades ago with the famous Meisterstück pen collection. It is then no wonder that their first mechanical watches were given the name "Meisterstück". The automatic caliber ETA 2000 or 2892, the automatic chronograph movement Valjoux 7750, or the hand-winding caliber Peseux 7001 power these timepieces. Today, Montblanc's repertoire includes complicated in-house movements with chronograph functions or tourbillons. A horological highlight is the Montblanc Villeret 1858 ExoToubillon Rattrapante from 2013, which has split-seconds hands and a patented tourbillon with the balance outside of the rotating cage. It is the only one like it in the world of haute horlogerie. Additionally, this watch also displays a second time zone and has a day-night indicator. Never worn versions of this white gold watch from a limited run of 18 pieces cost around 215,000 euros. Another top model is the Montblanc TimeWriter II Chronographe Bi-Fréquence 1000 . You can measure up to thousandths of a second with this chronograph. The manufacture movement MB M66.26 with two balance wheels is responsible for this enormous precision. Just as in the Zenith Defy El Primero 21 presented in 2017, one balance controls the time display and the other the stop mechanism. The latter swings inside the Montblanc watch with a frequency of 50 Hz, or 360,000 half oscillations per hour (A/h). The time display's balance frequency is a comparatively leisurely 2,5 Hz (18,000 A/h). Once you press the start button located next to the lugs at 12 o'clock, the central stop-seconds hand races around the dial in only a second. The hundredths of a second can be read with the help of a scale on the edge of the dial. Thousandths of a second are shown in a small window under 12 o'clock. At its introduction, a watch from this run of 36 pieces cost $305,000. Since then, you can find examples of this high-performance chronograph for around 230,000 euros. 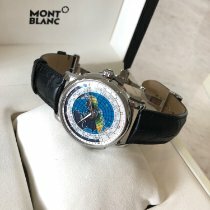 What do Montblanc watches cost? In addition to the horological masterpieces of the Villeret collection, Montblanc also offers considerably more affordable watches. You can get a pre-owned, battery-run quartz watch for around 500 euros. For around 750 euros, you can buy a never worn Smartwatch from the Summit series with designs reminiscent of the classic pilot's watches from the 1858 line. There are thousands of apps ready to download on the Summit thanks to its Android Wear 2.0 operating system. Some functions are already integrated, such as a fitness tracker, altimeter, and a heart rate monitor. A mechanical pilot's watch with a retro look from Montblanc costs about 2,000 euros in mint condition. At the other end of the price spectrum, you will find complicated watches with a chronograph function or a tourbillon. A red gold Montblanc Nicolas Rieussec Monopusher Chronograph , dedicated to the chronograph's inventor, sits around 17,000 euros in mint condition. 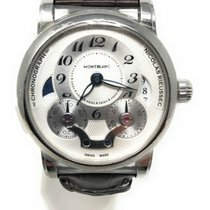 Montblanc presented this watch in 2008 at the Geneva Salon International de la Haute Horlogerie. They used the knowledge from their 2007 takeover of the manufacturer Minerva to develop their in-house caliber MB R100. The manufacturer from Villeret is a specialist in precise timekeeping. Today it is where Montblanc's horological highlights are produced. An example is the models with an ExoTourbillon that cost at least 25,000 euros. Watches that have a chronograph function in addition to the tourbillon reach prices of over 35,000 euros. The 18-karat rose gold Montblanc Heritage Spirit Perpetual Calendar sits around 14,000 euros. However, the stainless steel version can change hands for about 8,000 euros. On the border of France and Italy, Mont Blanc is the highest mountain in Europe, rising to 4,810 m (15,781 ft). The watch manufacturer Montblanc dedicated its 4810 collection to it. These watches have a timelessly elegant design that matches perfectly with business suits. Most of this line's designs have Roman numerals and use indices for hour markings. Stainless steel or 18-karat rose gold is used for the case. The silver-colored, guilloché dial with red gold numerals and indices feels especially elegant. The simplest variants have a day or day-date display. Examples with a date display at 6 o'clock can be found for 1,800 euros in mint condition. The automatic caliber MB24.17 based on the SW 200-1 from the ébauche supplier Sellita ticks inside these timepieces. You can purchase the day-date variant in stainless steel for around 2,200 euros. These watches also use an automatic caliber, the MB 24.18. One of the highlights of this collection is the Montblanc 4810 Orbis Terrarum with world time function. True to its Latin name, which means "world" in English, this world time watch has a colorful world map in the middle of its dial. This luxury watch is perfect for frequent travelers, given that it can show the time in 24 time zones simultaneously. In addition, the display tells you where in the world it is day or night. Using the push button at the 8 o'clock position, you can easily change your selected time zone. This luxury watch is run by the caliber MB 29.20, which is based on the Sellita SW 300 and was enhanced with a Montblanc manufacturer module. Pieces in mint condition cost around 4,000 euros. The top model from the 4810 collection is a tourbillon watch with a stop-seconds mechanism and a 10 mm thick case. A small whip stops the balance wheel in the Montblanc 4810 ExoTourbillon Slim so that you can set it to the exact second. A small red arrow on the tourbillon case takes over the role of the second hand. The small display at 3 o'clock is a practical feature that shows the wearer the current position of the crown. Three different positions are used to set the time, to wind the movement, and to stop the tourbillon. While wearing the watch, a small micro-rotor ensures that the watch winds itself. Unworn versions of this 42 mm red gold watch cost almost 30,000 euros. You can find sports watches in the Montblanc TimeWalker series. A majority of these watches also have a chronograph function. The automatic versions with date display are suited for people who prefer a neat dial. You can buy these watches pre-owned and in fine condition starting around 1,200 euros. Prices for unworn three-handed watches begin at about 1,800 euros. An automatic chronograph in fine condition can be had for a little less than 2,000 euros. If you want a stopwatch in mint condition, be prepared to spend 2,700 euros. Those who don't just want to measure time but also want to know the time in a second or third time zone should take a look at a Montblanc TimeWalker Chronograph UTC. The acronym UTC stands for Coordinated Universal Time and means nothing more than the generally accepted time. It is easy to set and read a second and third time zone thanks to the fourth central hand and a rotatable bezel with a 24-hour scale. The 43 mm case has a black outer layer and is water resistant up to 100 m (10 bar), so you can easily use this watch to go swimming. The caliber MB 25.03 is a modified ETA Valjoux 7754. 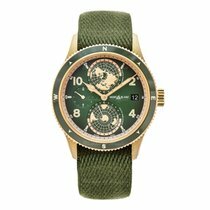 You should set aside around 3,500 euros for one of these watches in mint condition. The gem of the TimeWalker series is the TimeWalker ExoTourbillon Minute Chronograph, which has a limited run of 100 watches and a design inspired by motorsports. The two crescent-shaped subdials that count seconds and 30 minute intervals are particularly reminiscent of the tachometers found in cars. The button to start, stop, and reset the stopwatch are on the left side of the case at 8 o'clock. You can read the time and date on an extra dial on the upper half. The ExoTourbillon with a stop-seconds mechanism is at the bottom at 6 o'clock and is straddled by a massive bridge. The manufacturer caliber MB R230 can be observed through the case back made of sapphire glass. The titanium case has a black coating and is 44 mm in diameter. This special chronograph with tourbillon costs around 36,000 euros in mint condition. 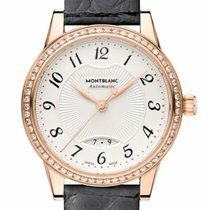 In the collection Bohème, Montblanc presents classically elegant women's watches. Several models have sparkling diamond trimming around the dial or bezel. The feminine design of many examples is emphasized with dials of mother-of-pearl. Cases of 18-karat gold also increase the watch's value. You can find variants in stainless steel with a date display and two hands for as little as 1,000 euros. The prices for quartz watches with moon phase displays begin around 1,500 euros. Mechanical Montblanc watches with a perpetual calendar or tourbillon are the horological highlights of the collection. The Montblanc Bohème Perpetual Calendar Jewelry model with a limited run of only 88 watches and reference number 116495 is made of white gold and fitted with 60 diamonds on the bezel. The automatic caliber MB 29.15 has a perpetual calendar with the date at 3 o'clock, the moon phase at 6 o'clock, the day at 9 o'clock, and the month at 12 o'clock. There is also a subdial under 12 o'clock that indicates whether or not it is a leap year. The blue alligator leather strap matches the guilloché dial with white gold Arabic numerals. Be sure to set aside at least 16,000 euros for mint-condition versions of this rare women's watch. The rose gold version costs about the same, though it is not a limited edition. If you want to see the balance wheel at work, perhaps the Montblanc Bohème ExoTourbillon Slim Jewelry in red gold is for you. The mother-of-pearl dial alone is set with 144 diamonds. There are an additional 58 diamonds on the bezel as well as a diamond on both the clasp and crown. The hands are made of red gold. This gold watch with tourbillon is 9.37 mm thick and has a diameter of 38 mm. Brand new examples of this watch sit around 48,000 euros.